This beer is the culmination of brain storming and contemplating seasonal brewing over the last few months. Back in July when the commercial pumpkin beers hit the shelves I was quite perturbed. They were invading my summer beer shelf space with sweet, overly spiced wheat beers way too early. I was still enjoying refreshing berliner weisses, hoppy pales and IPA’s. I made a personal resolution to avoid buying all pumpkin beers this year. I can’t sit idly by when they put the beer out so early that it’s old by the time fall sets in and I want to enjoy one. Since I wasn’t planning on purchasing any pumpkin beer, I figured I would need to make my own, when pumpkins and squash were in season. When I was planning this beer, I also listened to Brewing with Style ESB show. The Brewing Network show focuses on the commercially available versions of a style and how the match the criteria of the BJCP style guide. In the ESB episode, they made a point that most ESB are not heavy on the english carmel malt, but that Fullers ESB does lean that way. Having never really sought out an ESB, when I found a Fullers ESB on draft I had to try it. It has a subtle hop flavor, a non harsh bitterness, and a very malty profile. After enjoying it, the two ideas merged and I began to envision an esb like Fullers as the base for a pumpkin / winter squash beer. I started with the brewing classic styles ESB recipe, and added a variety of winter squash, no spices, or other adjuncts. My recipe is not a traditional pumpkin beer spiced to provided the pumpkin pie flavor. I tried to bring roasted squash flavor, rich mouth feel, and hopefully a subtle winter squash back ground to a graham cracker and caramel ESB. If I get nothing but a caramel ESB, hopefully I’ll still be able to rim the glass with some cinnamon sugar and call it a pumpkin beer. My brew night incorporated some process changes as I’m moving toward brewing smaller batches. I’ve swapped to a smaller mash tun, and smaller pots and kettle. Working with smaller volumes of grain, wort, and water are all easier and faster, in addition the beer will also turn over faster. I didn’t have any issues caused by the equipment switch, and finished up my night earlier than usual. I managed to handle much of the prep was before the brew day, I roasted the squash, made my starter and I emptied the keg on Saturday. I milled the grain, measured out my hops, and washed the keg on Sunday. In the early evening on Tuesday I brought up all my brewing gear. By Tuesday I was chomping at the bit to brew. I get this way if I haven’t brewed in a while, independent of the volume of beer I currently have in kegs, or fermenters, hence the desire to brew smaller batches, more often. I mashed a touch low, at 149.5, targeting 150, for 75 minutes. I only lost 1 degree over that period. When I ran off, after vorlauf I only managed 2g, before runoff stopped. I had forgotten to add rice hulls to the grain bill after milling. So I added a few large handfuls of rice hulls before mixing in the batch sparge and gave it a good stir. The second runnings ran off much better. 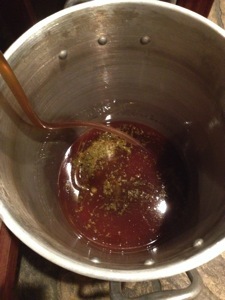 While the wort was running off, I added the squash mix and first wort hops to the pot. 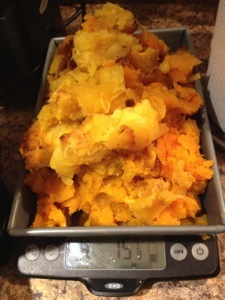 The squash had been roasted, skinned and put into a BIAB bag. 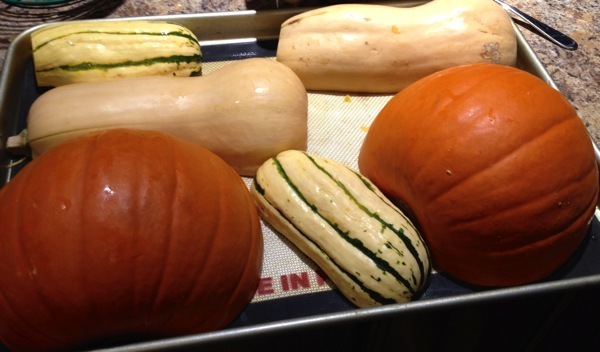 The squash mix was one delacata, one sugar pumpkin, one butternut, and one acorn. The reason for this squash steep is that I could not come to a consensus on the best method to handle it. CBC mashes the pumpkin, others add it to boil, and another batch of folks add it to secondary. The consensus on brew night was to try to allow the mash enzymes to convert some of the starches, and I didn’t want my mash any sticker than it already was. I felt treating it like steeping grains would be the best bet. Next time I think I will try to steep them longer, keeping them at 150 for 30m or longer, giving them as much enzyme exposure w/out compromising mash run off. When run off was nearly complete, I put the kettle on heat, then I pulled the squash bag as the wort approached 180. The boil was uneventful, I was surprised that there was no big head on the hot break. It barely rose in the pot before dispersing. JD suggested that there could have been some oils from the squash that broke the surface tension and prevented foaming. I was expecting a ton of scum and hot break, but there wasn’t much of either, just a nice rolling boil. The newly adjusted turkey burner seemed to run cleaner, but far from a soot free blue flame. We let the boil continue, and some brett and sours beers we each had brewed. I generally don’t drink or have company while brewing. It’s not that I’m uptight about company, or drinking, but I’m easily distracted, and I lack confidence in my process. I’ve been brewing since 2011, I’ve only brewing All grain for less than one year. There are many gaps in my process, and knowledge, and I’m a bit self conscious that I’ll do some rooking mistake and look foolish. Not to disappoint, I did make a mistake. After putting in the chiller, adding whirl floc and yeast energizer, we discussed the difference between yeast energizer and yeast nutrient (I have the wrong one). I got caught up in the conversation, and forgot to add the 0 minute hops when I turned off the flame. To compensate, I decided to add the as dry hop. I’ve read or heard that dry hopping during fermentation and after fermentation have different results. There is some transformation that takes place in the presence of year. I can’t find the exact source to cite, but it’s in For the love of hops, or the pod casts with Stan Hieronymus. So, I added them as dry hop on day 3. The post boil went smoothly, my og was low by 2 points, but that’s within reason having not worked out my volumes on these new pots. For the record, handling 3 gallons of beer is much easier than 6. 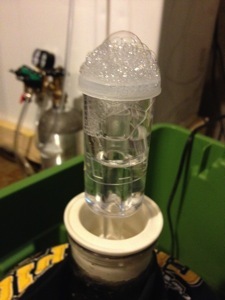 After transfer to primary, I oxygenated the beer for a full 15 count. Added a decanted starter of Wyeast London ESB 1968, by wednesday am the beer was already chugging away. I added the 0 minute dry hops Friday am. I expect this to be fermented out quickly, the mash temp was low, I’m fermenting this warm and it took off so fast. Although there is no rush to get this to a keg, I just want it ready for serving for Thanksgiving, the right time pumpkin beers should be on the shelves. Brewing ‘Mildly alcoholic’ beer Fall is the Saison Season Partially completing a goal. Preparing to brew my first a partial mash beer. Duo Brew Day Taking a second chop at the daisy cutter.